If you are like most soon-to-be mums, you are probably somewhat tired of how often you hear “Never let the baby sleep in your bed!” and all of the concerns and statistics about SIDS (Sudden Infant Death Syndrome). Put the baby in your bed, you and your partner risk rolling on the baby, or risk the baby getting caught up and suffocated in your bedding. Don’t put the baby in your bed, and baby may suffer from lack of closeness and comfort, will not be able to nurse on demand, and will probably NOT sleep very much at all. After 9 months of being nice and cozy in the womb, it’s no wonder they can’t sleep sprawled out flat on their back in the open air on a rather thin and hard mattress! Let’s not forget that if you do keep baby in a separate crib, you will have to get up to check on her, comfort her, and certainly to feed her. All of which pretty much nullifies whatever safety there was in keeping her separate, since in your exhaustion, you will be in danger of falling asleep and dropping her, as did one exhausted young mother I know. BUT – there IS a solution! If you haven’t heard of them yet, they’re called co-sleeper cots, or baby side sleepers, and they are the best baby sleep solution I have ever encountered! A co-sleeper cot or crib is very much like a traditional crib or bassinette, except that it is made to fit alongside and even attach to your bed. 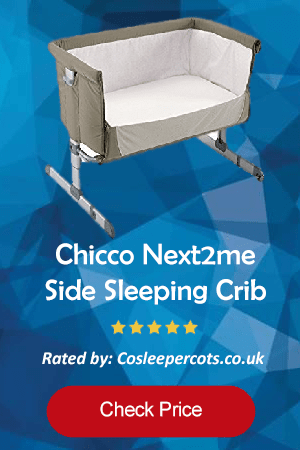 These cots have one side that can be lowered (some of which then attach to your bed) so that your baby’s sleeping surface is flush with your bed, enabling you to literally reach out and touch him without having to get up or even sit up, and without allowing the possibility of you rolling on him. Safety: because these cots have flat, thin mattresses, three solid, safe walls with the option of a fourth or to be against your bed, they meet all of the safety standards. They keep a baby on her back, on a firm mattress without too much bedding, and allow her to sleep safely in her own sleeping space without danger of being rolled on. These cots avoid all of the dangers that bed-sharing (keeping baby in bed with you) gets a bad rap for. Proximity: while avoiding the dangers of bed-sharing, you still get all of the closeness of it. You will literally just have to turn onto your side and you’ll be able to see, reach out and touch, and hear baby inches from you. And he will benefit from hearing, smelling, and feeling you as well, which is what many newborns need to be able to sleep peacefully and be comforted. If he cries, you won’t even have to get up to see what’s wrong and soothe him. Nursing: if you plan to nurse your baby, you can probably see why this is a fantastic solution. Most lactation consultants actually promote the side-lying nursing position as the best for both mum and baby, as it allows mum to keep resting and provides better milk-flow for baby. However, because of the dangers and fears about bed-sharing, many mums avoid this position, knowing that they will likely fall asleep if they continue lying down while nursing. Well, a co-sleeping cot allows you to easily nurse in the side-lying position without worrying that you could accidentally roll on your baby in your sleep. Sleep: first, when your baby gets to sleep so near to you, and be so easily soothed, she will likely sleep better in the first place, which means you will also get more rest. That is sleep benefit number one. Sleep benefit number two is that, even if you are waking up frequently throughout the night because your baby is hungry, you will not have to worry about falling asleep while nursing her. You can safely nurse on your side and even fall asleep without the typical dangers of nursing her in your bed. This is a huge benefit as many mums, because of all of the fears surrounding bed sharing, will get up and go sit in a recliner or rocker while nursing their baby in the night. But they are extremely sleep deprived and exhausted when they do this. The result is that many mums start falling asleep while nursing their babies, which means they are at serious risk for dropping their babies, as happened to my previously mentioned friend. This is not a safe solution to bed-sharing! The co-sleeper, however, solves this problem completely, allowing you to safely sleep while nursing baby.